INVEST in your child's development to think smart, act smart and behave smart! Greetings from Vbuzz Communication & Coaching Studio! 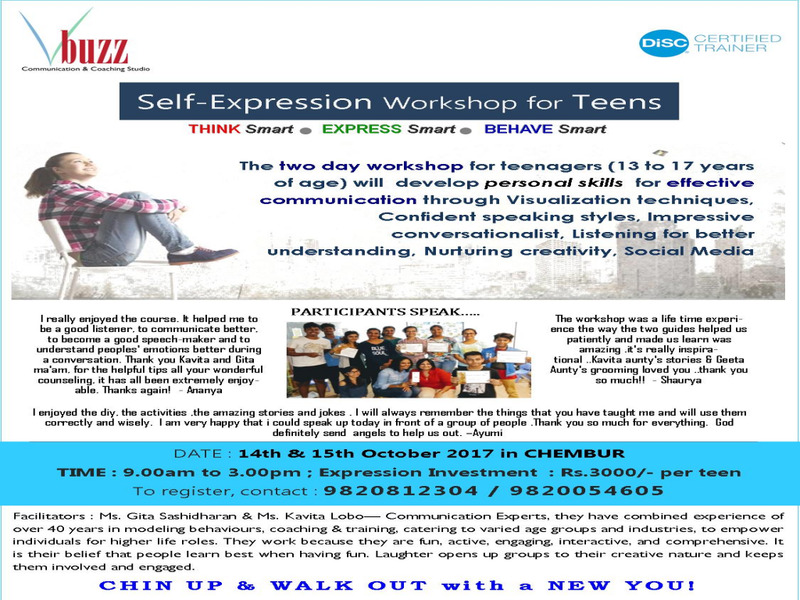 Announcing a 2 day highly interactive Self Expression Workshop for Teens offered by Vbuzz Communication & Coaching Studio in Chembur, Mumbai on 14th & 15th October 2017 to help our teens stand up & be more confident about oneself. Why attend the Self Expression Workshop? In a competitive scenario it has now become the need of the hour to present oneself a notch above the others. Due to the intense pressure of an action- driven world, individuals face challenges in self- identity, hence are unable to express the difference between needs and wants. They are constantly bombarded with advises, be it in career choices, subject choices or any personal choices. With an abundance of information available dovetailed with family, peer pressure, teens find it hard to fit in. We are emphatically stating "why fit in?”; Each one of us are unique in our representation. We need to ‘listen' to our inner teacher, trust ourselves to make right choices and stand out confidently. This workshop is designed to aid today’s teens to help find themselves, because everything else can be googled!!! - knowing ones behavioral style to able to adapt to different situations. If your child is a keen learner, would like to keep nurturing their real self, to hone their talent and understand & equip with creative & innovative resources, want to deep dive into personal effectiveness and advancement to reach life goals, then this workshop is ideal for you. Call today at 9820812304/ 9820054605 to reserve your seat. Or simply write to us at kavitalobo@gmail.com/gita.sashidharan@gmail.com for any queries, we will be happy to assist. Gita and Myself at Vbuzz Communication & Coaching Studio are looking forward to yet another empowering session this festive season. Join us Today. About the Facilitators : Ms. Gita Sashidharan & Ms. Kavita Lobo— Communication Experts, Certified DiSC Behaviour Styles Trainers, together they have combined experience of over 40 years in modeling behaviours, coaching & training, catering to varied age groups and industries, to empower individuals for higher life roles. They work because they are fun, active, engaging, interactive and comprehensive. It is their belief that people learn best when having fun. Laughter opens up groups to their creative nature and keeps them involved and engaged.